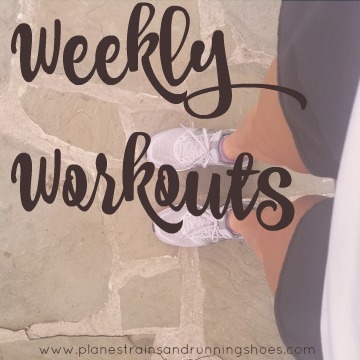 Since I started this blog, I've struggled with finding a way to keep track of my workouts and hold myself accountable in this little internet space. Sunday Sweats are a pretty popular post and I've decided to try them out this year, so here goes! It was cold, rainy, and miserable but I loved every minute of this run. It was my first run of the New Year, The Pilot came along, and it was our first time running in our old neighborhood since we moved back last week. This was a perfect, hip opening practice and just what I needed. I've done Yoga with Adriene's 30-Day Challenge twice now and I wasn't actually planning on making it a 30-Day challenge this time around but on Tuesday, I decided to. Wednesday was a tough day. It took me nearly an hour and a half to get to work. I brought my running stuff to run at lunch and then had to deal with a work situation. When it took me another hour and a half to get home, I knew I wasn't going to run and I was really beating myself up over it. Then I realized that I do this to myself every Wednesday. It's my busiest day of the week and I don't realistically think I'm ever going to be able to run on a Wednesday so why try? I got home and got on the mat, had a wonderful yoga practice, enjoyed dinner that The Pilot made, and then spent some time with him. It was much better than trying to cram in a run plus yoga and being exhausted. I worked from home on Thursday and practiced at lunch. I think this is my favorite challenge of Adriene's so far. I had plans to meet up with some Junior League ladies for a run around the Mall that evening. I was worried when I saw snow flurries but went anyway. There were only three of us, which was actually great. We got in some great miles running the monuments at night, made new friends, and had a great conversation! I worked from home again on Friday and wrapped things up by 4:30 which, I thought, gave me enough time to run before it got dark out. Friday's yoga practice focused on ab work, which I'm still sore from! After work, I set out for a few miles on a nearby trail and 3 miles in, it was already dark. Two blocks from finishing my run, I tripped over an uprooted sidewalk and fell flat on my face. I landed hard on my knee cap, ripping my running tights. I've never fallen so hard and it hurt badly. I immediately teared up and panicked. I got up, hobbled to a nearby stoop and sat down. About 10 minutes later, I got up and stumbled home. When I got home, my knee was bruised and bloody, and had swollen really badly. It looked like a golf ball was growing out of my knee. I iced it on and off for the rest of the night and went to bed. I woke up Saturday morning and my knee was still swollen and felt really stiff. I ate some breakfast, took some ibuprofen and iced it on and off before meeting up with a friend for brunch and running some errands. I was on my feet a lot yesterday, which I actually think helped things. My knee was still really swollen but by the end of the day, it was starting to feel a little bit better from Friday. We got a few inches of snow and everything froze over so I went to bed unsure whether to run Sunday or give my knee more rest. Luckily, today's yoga practice didn't require anything on all fours, so I breezed through the practice, which focused on balance. I woke up this morning with my knee still swollen, unable to put any weight on my right leg. Before panicking, I sat down and iced it to see if it was just stiffness from sleeping. That's exactly what it turned out to be and I was able to make it to the grocery store walking just fine. I got home and decided to try out a run. I headed out and it definitely hurt more to run than walk, but the pain was manageable. Two blocks in and I stopped. I don't want to turn this into something when it might just be a bad bruise and I didn't want to run into a situation where I was a mile from home and needed to stop running, so I came home, and got lucky to find that today's yoga practice again kept me off of all fours. It was a beautiful, relaxing practice focused on serenity, and just what I needed. So my first week of 2017 got off to a bumpy start but you know what? This is running. Setbacks happen. I'm grateful that so far, this doesn't seem to be anything serious. My long run planned for the week was 6 miles and I did manage to get in a 5 mile run so I don't feel like I'm too far off. I just need to be mindful and take it easy. I have big running goals for this year and, while it's tough to start the year with more rest than I would like, I also know that I won't hit those goals without giving my body the rest it needs. If you aren't sure what #yogarevolution is, check it out here. I've been following Yoga with Adriene for a few years now and her free YouTube videos have really changed the way I practice yoga! I recently took a class with an old favorite teacher who I hadn't seen in almost a year and she complimented my practice, saying that it's really improved. If you're looking for an at-home practice, I can't recommend these enough! What goals are you chasing in 2017?